Before we tell you how to combine profiles, we should probably start by explaining what they are. The profile of a piece of siding refers to its physical appearance: this includes the shape and height of each panel of the siding, as well as how much of it is visible. 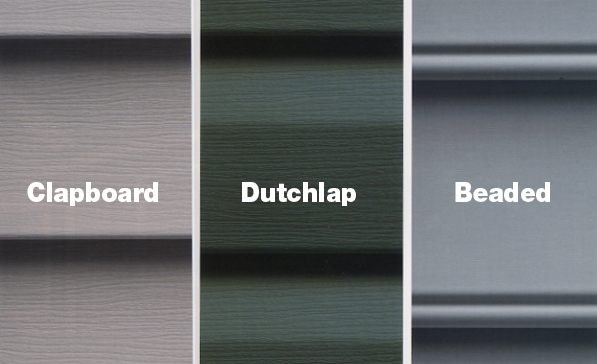 Note that the term “profile” also applies to other types of vinyl siding as well – for example, vertical and cedar shake siding are also available in a wide variety of profiles from their manufacturers. Envision it. Carefully review your colors and profiles (lap, shake, vertical, etc.) before deciding which products you’ll use to achieve the look you’re aiming for. As a good rule of thumb, it helps to mix and match within the products available from a single manufacturer, as installation materials and requirements may vary from one manufacturer to another. Measure it. Designate which portions of the exterior you wish to devote to each profile (ie. use shake in the gable and lap on the main portions of the house), then measure carefully to ensure you’ll have enough resources to fully complete those areas. (You know what they say: “Measure twice, cut once!”) When working with siding, you will almost always end up with surplus product, but that’s by design: it’s better to finish with too much left over than to come up short and discover that your supplier no longer has your style in stock. Achieve it. Be sure to coordinate with your contractor so they are fully aware of your goals. Don’t assume they know which profiles you want to use where, as every installation project is different. And definitely don’t make them guess – you won’t be happy with the results. One final word of advice: you can experiment with CertainTeed’s ColorView tool here to preview siding colors and profiles on your computer prior to placing an order. This can help you get a better idea of how products will look on each surface area of your home, then review those selections with your contractor so they’re on the same page as you.